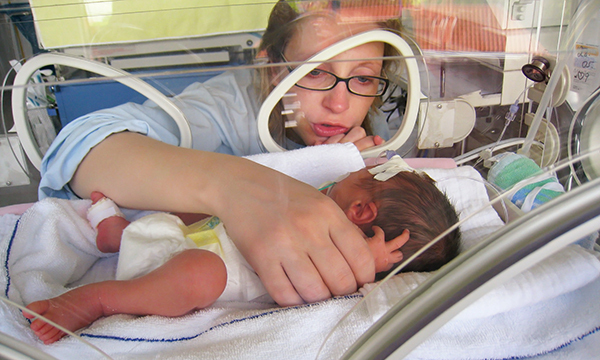 Infants in neonatal intensive care units (NICU) who receive direct care from their parents have an improved health outcome, a study has found. The trial, carried out in Canada, Australia and New Zealand, found that family integrated care (FICare) also helped with parents' wellbeing. Eligible infants were born at 33 weeks' gestation or earlier and had no or low-level respiratory support. Parents gave written informed consent for enrolment. Parents in the FICare group had to commit to be present for at least six hours a day, attend educational sessions, and actively care for their infant. Parents in the FICare group and standard care group (parents not involved with FICare) were asked to complete questionnaires. Parents were taught the skills required to provide many aspects of their infant's care, such as bathing, feeding, providing skin-to-skin care, dressing, diaper changing, administering oral medications, and taking temperature, as well as how to interact with and support their infant's development. Additionally, parents were encouraged to actively participate on ward rounds, chart their infant's growth and progress, and participate in making clinical decisions about their infant's care with the medical care team. At day 21, weight gain was greater in the FICare group than in the standard care group. The high-frequency exclusive breastmilk feeding rate at discharge was higher for infants in the FICare group (279 [70%] of 396) than those in the standard care group. At day 21, parents in the FICare group had lower mean average stress scores than parents in the standard care group. There were no substantial differences between groups in the rates of mortality or major morbidity.